For Christmas 2018 I had one thing at the top of my wishlist; a sleek and stylish minimalist travel backpack that would be perfect as a carry on backpack for city travel. Simple, right? Apparently not. What followed were countless nights of tearing my hair out, emailing slow customer services and regular visits to airlines websites for carry on luggage dimensions. Dreams were crushed, hope was lost….ok, ok, I’m exaggerating but you get the point. It was a slow process. Basically, what I wanted was no extra straps (which pretty much ruled out Osprey), an affordable(-ish) price (bye bye Aer) and delivery to the UK (see you later Tortuga). 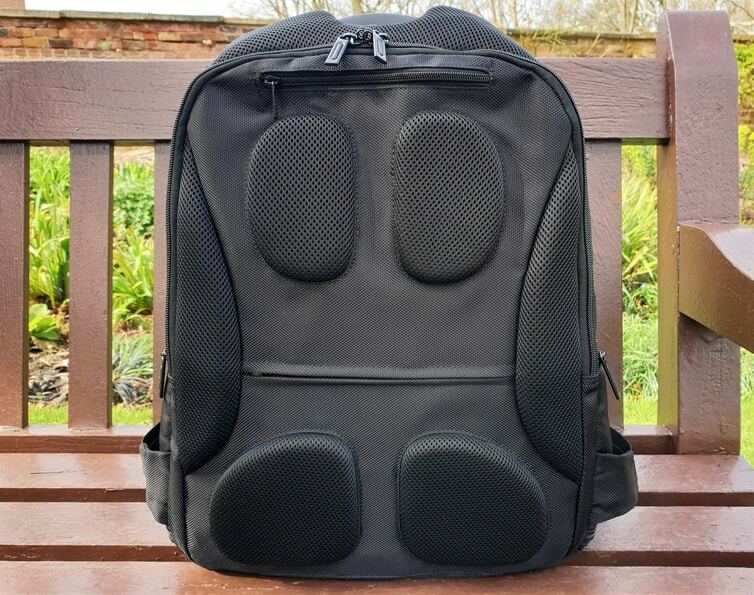 Ideally it would be a laptop backpack that I could also use for one bag travel. 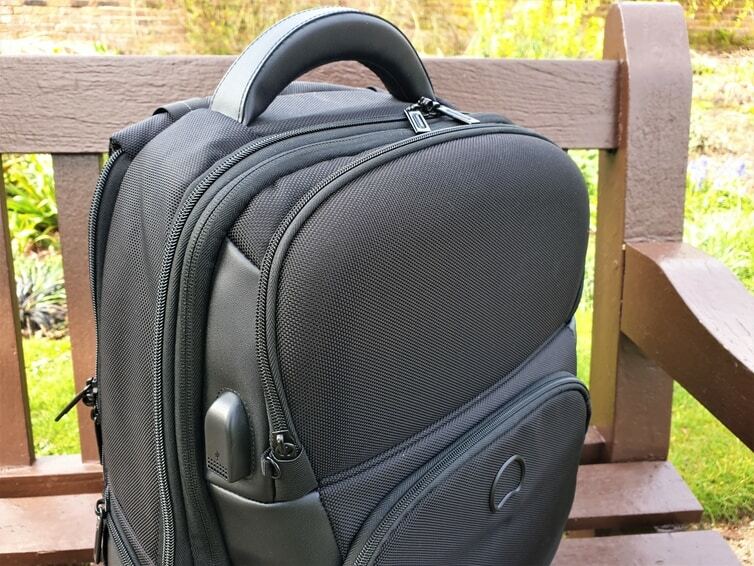 My final three backpack choices were a Samsung Infinipak, a Haglöfs Backup and a Delsey Quarterback Premium. Ultimately, the Delsey Quarterback Premium backpack won my heart. I liked the stylish design, multitude of compartments and extra safety and tech features. 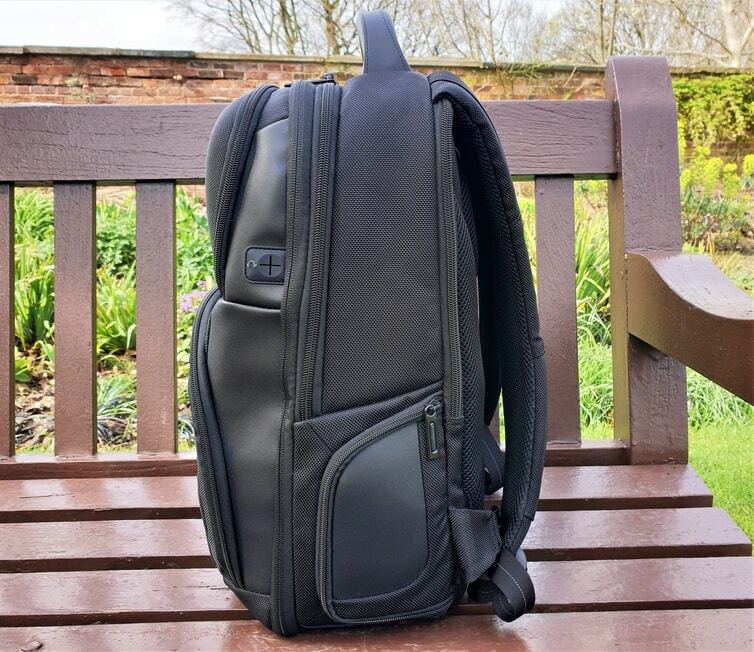 I’ve brought my Delsey backpack on a couple of trips now and thought it was time to give a full (crazily detailed 1500 word) review of my experience with it. 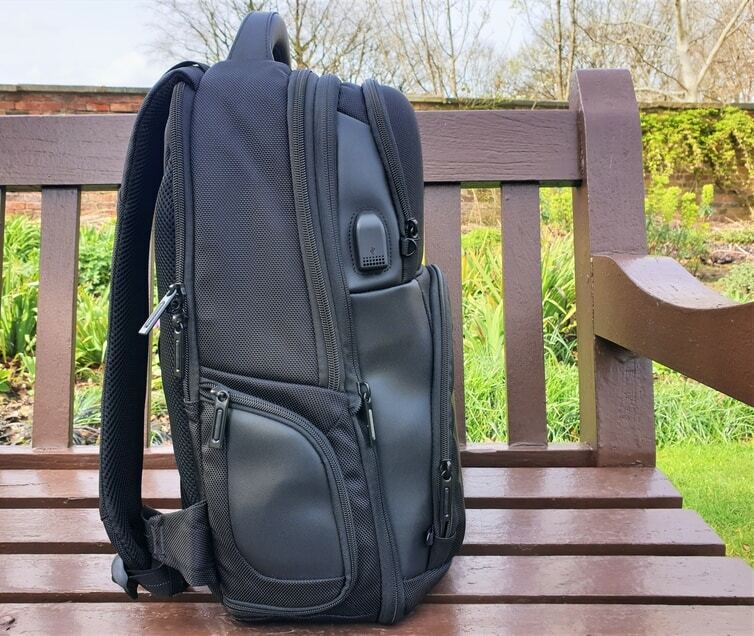 Whilst researching this blog post, I found a marketing blurb that told me the Delsey Quarterback Premium range is aimed towards the professional gentleman who prioritises a lightweight and functional business bag. Wait, what? Turns out I have plenty in common with professional gentlemen. Who knew? 23.5L – fits a 13 inch laptop. 2 compartments. H.44 x W.30 x D.19.5 cm. 1.4kg. 33.7L – fits a 15.6 inch laptop. 1 compartment. H.50 x W.35 x D.21 cm. 1.5kg. 36L – fits a 15.6 inch laptop. 2 compartments. H.49.5 x W.36.5 x D.21.5 cm. 1.6kg. This is the one I’m reviewing. 39.2L – fits a 17 inch laptop. 2 compartments. H.51 x W.38 x D.22 cm. 1.7kg. 29.8L – fits a 17.3 inch laptop. 2 compartments. Trolley backpack. H.52.5 x W.37 x D.24 cm. 2.9kg. All models can be expanded. Whilst the 13 inch and 17 inch models have obvious differences, let me just briefly discuss the 1 vs 2 compartments dilemma on the 15.6 inch size. Essentially, the main difference between the two is the location of your laptop compartment. 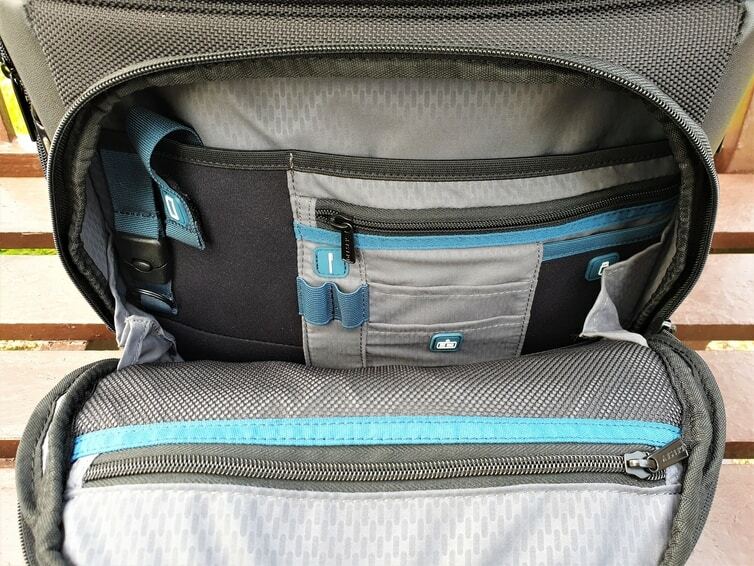 In the 2 compartment model, you have a dedicated laptop compartment located under the shoulder straps. You then have a second compartment opening from the top for your other belongings. In the 1 compartment model, the padded laptop section has been moved into the main compartment and opens from the top. Personally, I wasn’t keen on the idea of my dirty socks next to my laptop, sooooo I went with 2 compartments. 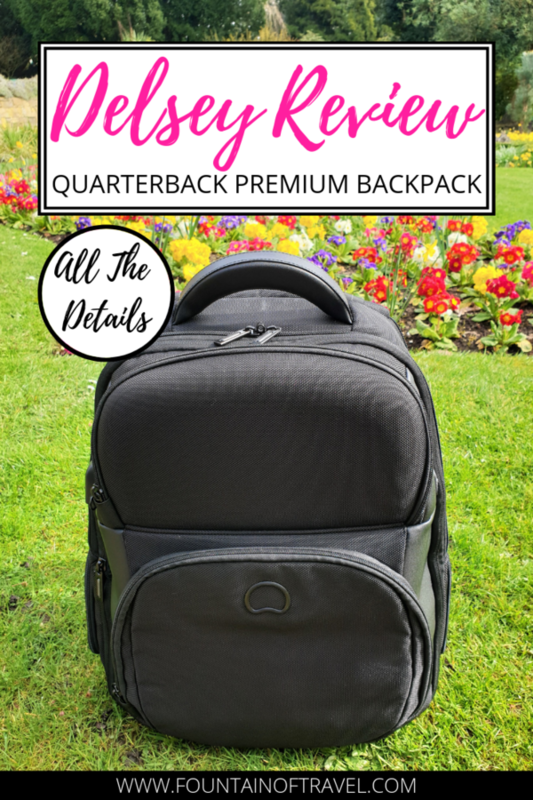 Let’s start off this Delsey backpack review by going through the features of the Delsey Quarterback Premium (and there’s plenty!) before moving on to its comfort and suitability as a carry on backpack. As I mentioned before, this particular Delsey backpack comes with a separate laptop compartment situated under the shoulder straps. I quite like the safety aspect of this, as you (or anyone else) wouldn’t even notice the compartment when the backpack is worn. To access the compartment, you have to turn the straps forward. 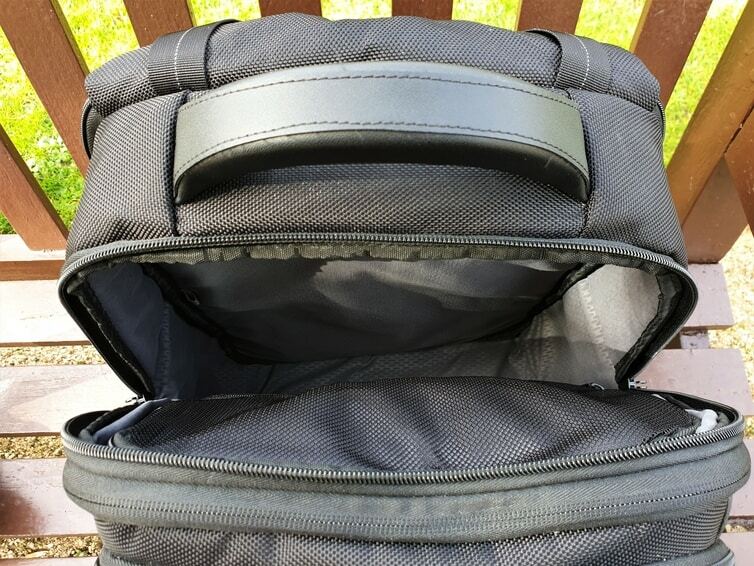 Inside there is a padded pocket for a 15.6 inch laptop along with a pocket for a tablet. 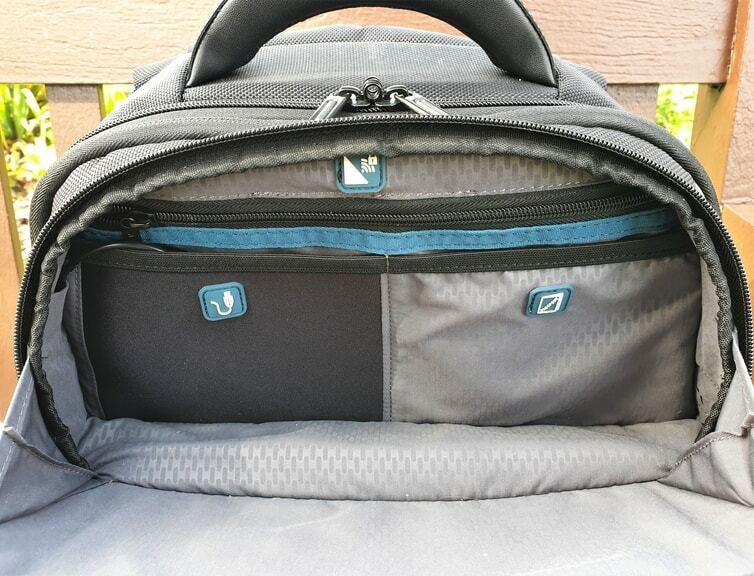 The laptop pocket closes with a velcro detail strap. 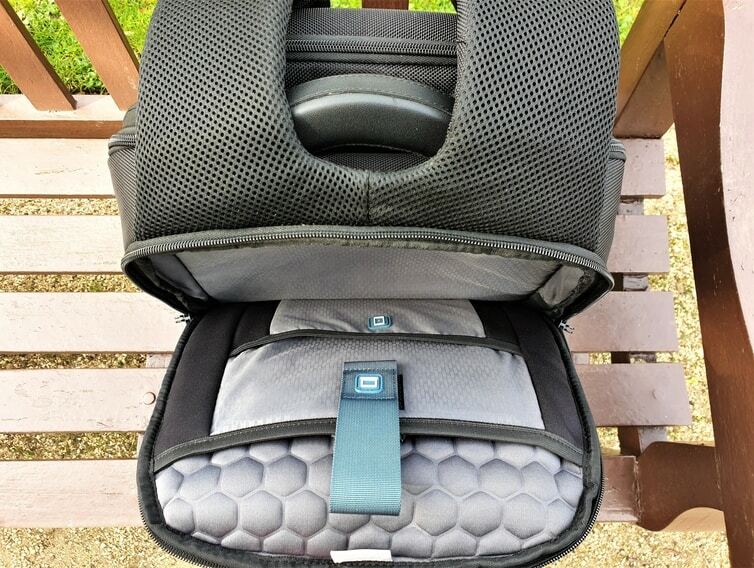 If you’re carrying both a laptop and tablet, you wouldn’t really fit anything else in this compartment. The main compartment has a soft fabric lining with a zip pocket as well as zipped mesh pocket. I used this backpack for a 3 night city trip to Dublin (admittedly without bringing a laptop) but could easily have packed enough clothing for 5 nights. In addition, the expansion zip adds about an inch of extra space to the compartment. What I like about the Delsey Quarterback Premium backpack is the versatility of the two front pockets. The top one has a hard shell made from RFID-blocking material. Inside, there is a pocket for your passport (although I prefer to keep mine in one of the back pockets) and a zip pocket. My favourite feature, however, is the battery pocket. 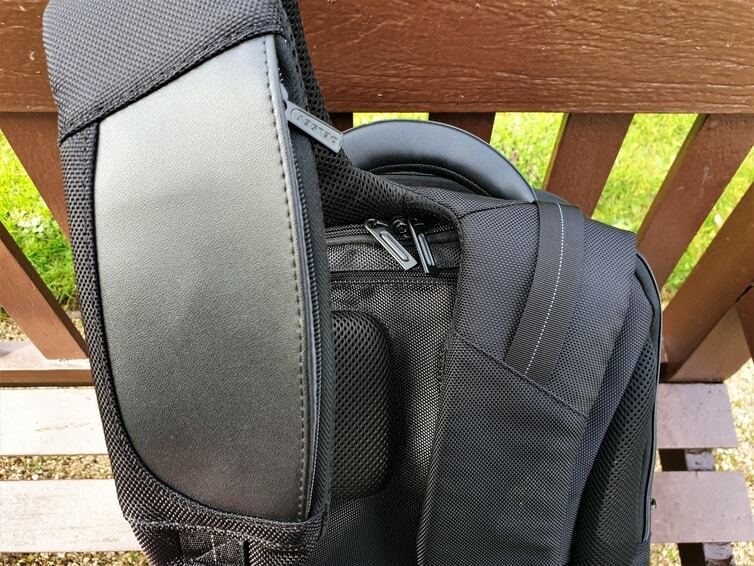 It comes with a USB charging cable that is connected to the exterior of the backpack. So basically, you can place your powerbank in the pocket and attach e.g. your phone charger to the USB port on the outside of the backpack. On the opposite side you have a hole for your ear phones. The second front pocket is a soft shell and comes with multiple internal sections. You have a phone compartment, two zipped pockets, a USB pocket, a large unzipped pocket and finally two spaces for pens. Perfect for anyone out there whose idea of paradise is finding your pen in less than 5 seconds. On the back of the Quarterback Premium you have a small zip pocket that is perfect for passports. 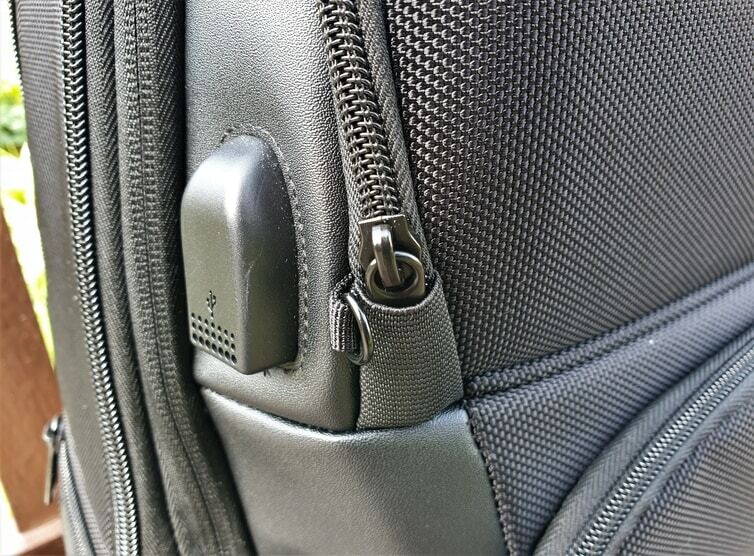 Below you have two zips that can be unzipped to place the backpack on a suitcase handle. Alternatively, you could use it as an extra pocket. Right, we’re getting to the end of the features list (told you there was a lot)! To finish off, there are two side pockets that can be unzipped to fit a water bottle. Additionally, you have a pocket on the right strap where you could stow away extra cash or keys. Lastly, I’m a big fan of the handle on the Quarterback Premium. It’s made from sturdy plastic and very similar to a suitcase handle. This makes the backpack really comfortable to carry during e.g. passport controls (when you can’t be bothered taking the backpack on and off to locate your passport). The Delsey Quarterback Premium backpack comes with a TSA approved combination padlock; great if you’re not going to close and open pockets during transit. A nifty little detail are the anti-theft zips on the two front pockets. It might be a bit of a stretch to call them anti-theft but the elastic detailing does make it harder to access the zip pull, slowing down any pickpockets. All of the Delsey Quarterback Premium backpack models come with a 10-year worldwide guarantee! Which means that I and all those professional gentlemen out there can enjoy our city backpacks for at least another 10 years. I’m a quite minimalist packer and hate that scramble to board on budget airlines where everyone fights for overhead space. 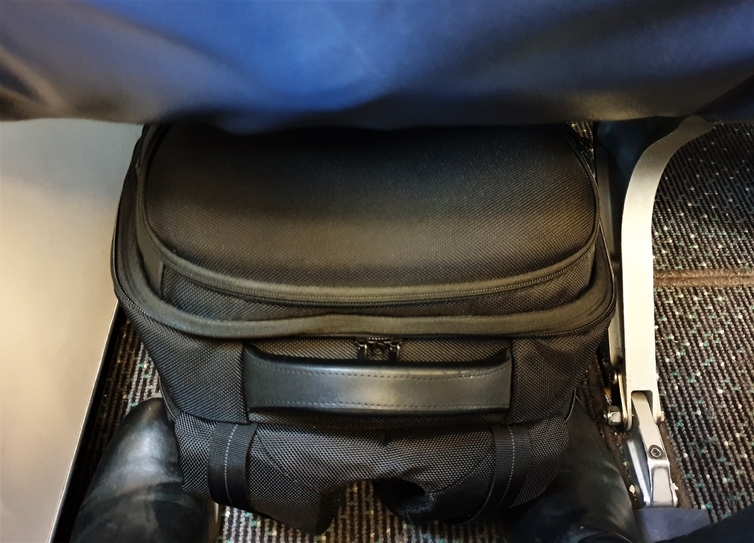 I therefore believe that the key to a really good travel backpack is its ability to fit under the seat in front of you, and not just in the overhead compartment. I was a little bit worried about the size of the Quarterback Premium but I’m happy to say that I’ve had no issues so far; it has fit under the seat on both SAS Scandinavian Airlines and Aer Lingus. I’ve yet to try it on Easyjet but I’m sure that day will come. Another key consideration is obviously the backpack’s capacity. As mentioned earlier, I reckon I could fit 5 nights worth of clothing into this backpack but it depends on your style of travel, packing habits and destination (hot or cold). Again, I’ve been lugging bags back and forth to Sweden for several years so have developed minimalist packing habits. Either way, I strongly believe that most people could use the Quarterback Premium as a weekend bag without any problem. I have also brought the backpack along for a girly sleepover and can confirm that the bag holds 3 medium sized bags of crisps along with a change of clothes. Just in case snacks are important to you. How you rate the comfort of a backpack will depend on how long you intend to wear it. Hiking backpacks are obviously designed for long days of walking, whereas the Delsey Quarterback Premium is a city travel backpack. Essentially, you’re expected to wear it during transit and then leave it in your hotel for the day. With that in mind, the Quarterback Premium doesn’t come with a hip belt (I personally find hip belts incredibly annoying but they’re good for weight distribution). The backpack does come with a lot of padding on the back though and I would definitely say that it’s a comfortable backpack for transit use. The Quarterback Premium is also fairly lightweight and doesn’t add a lot of bulk. My biggest beef with this backpack though are the straps. I find them just a bit too wide and I wouldn’t place myself in the narrow shoulders category. I suppose this is where the gentleman statement above comes in; the straps are probably designed for a (hunky, broad-shouldered gentle)man. For me it’s a minor concern, but if you’re a delicate build it’s something to consider. You can buy the backpack through Delsey’s official website, Amazon or specialised luggage stores. 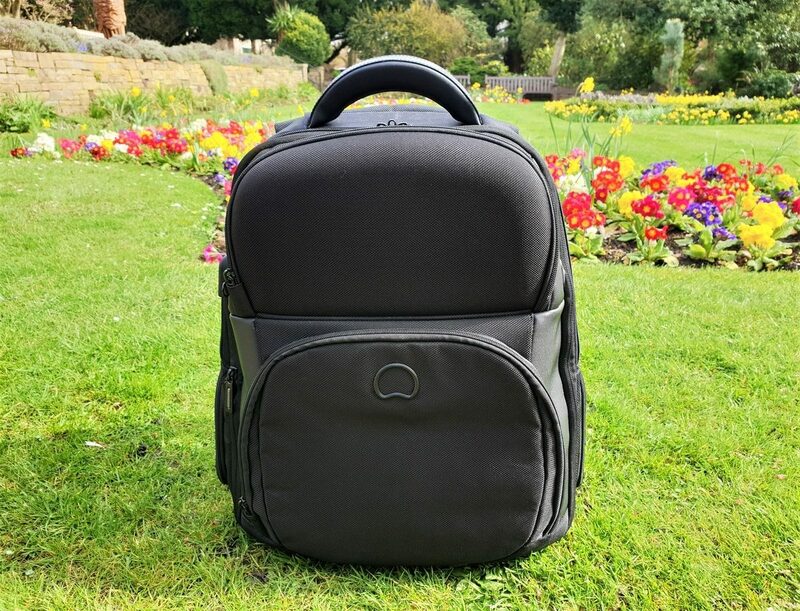 If you’re looking for a smart backpack that is ideal for short city breaks and one bag travel, then I would definitely recommend the Delsey Quarterback Premium. 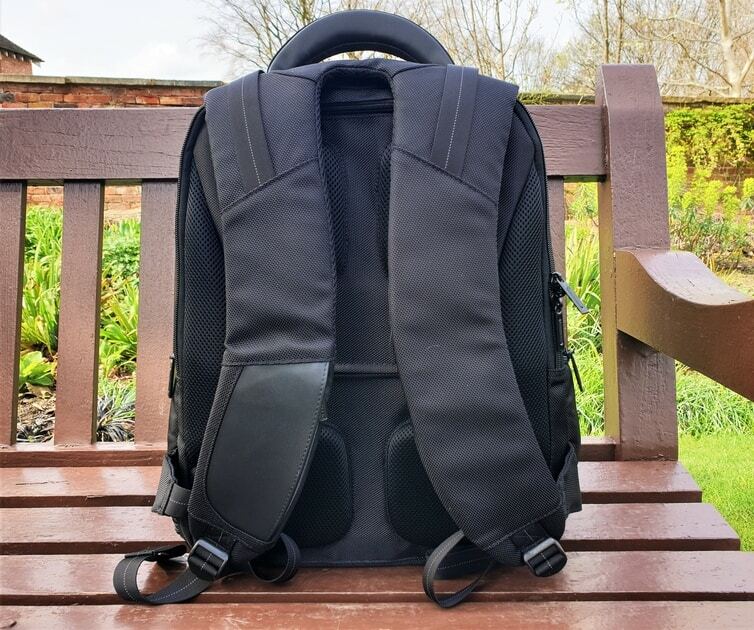 It has a really well-thought out design, plenty of extra features and works both as a laptop backpack for travel and a city weekend backpack. Like I mentioned, the main drawback is the width of the straps and you’ll definitely want to consider that before making a purchase. Apart from that, I can so far not fault this backpack and look forward to bringing it with me on many more city breaks. What’s your favourite travel backpack?